This document specifies WICD (Core/Full) 2.0, a Compound Document profile based on XHTML, CSS, SVG and XForms, which is targeted at desktop agents. In early development of the CDI WICD profiles, it will be done in one document. Then split into appropriate documents: core and full profile. This is a First Public Working Draft of the Compound Documents by Inclusion Framework (editor's draft). Public comments to this Working Draft can be made to public-cdf@w3.org. This list is archived and acceptance of this archiving policy is requested automatically upon first post. To subscribe to this list send an email to public-cdf-request@w3.org with the word subscribe in the subject line. For example, XHTML-formatted content can be augmented by SVG objects, to create a more dynamic, interactive and self adjusting presentation. A set of standard rules is required in order to provide this capability across a range of user agents and devices. This document defines a generic language-independent processing model for combining arbitrary document formats. The Compound Document Framework is language-independent. While it is clearly meant to serve as the basis for integrating W3C's family of XML formats within its Interaction Domain (e.g., MathML, SMIL, SVG, VoiceXML, XForms, XHTML, XSL) with each other, together with CSS and the DOM; it can also be used to integrate non-W3C formats with W3C formats or integrate non-W3C formats with other non-W3C formats. WICD Core is the foundation of rich multimedia content and describes rules for combining Hypertext Markup Language (XHTML) and scalable child objects, such as Scalable Vector Graphics (SVG) in a non device specific manner. WICD (pronounced "wicked") is an acronym for Web Integrated Compound Document. 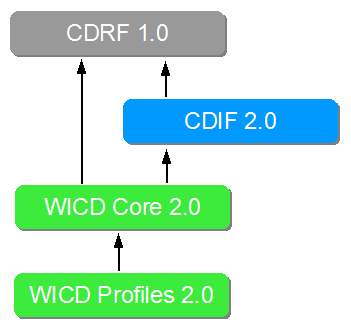 WICD builds upon CDRF 1.0 and CDIF 2.0. Profiles designed to enable rich multimedia content on a variety of devices such as: mobile handset devices, dekstop-type agents, and others. WICD 2.0 profiles will require both CDI and CDR integration. There will be no CDI only profiles. Conformant WICD Full 2.0 by Inclusion user agents must support XHTML 1.1 - Module-based XHTML as a root document and language. Conformant WICD Full 2.0 by Inclusion user agents must support XHTML 1.1 - Module-based XHTML as a child language. XHTML documents authored for the WICD Full 2.0 by Inclusion profile should be associated with the "application/xhtml+xml" mime type. Conformant WICD Full 2.0 by Inclusion user agents must support Scalable Vector Graphics Tiny 1.2 [SVGT12] specification as a child language. Per Hamburg07F2F, this profile will be the CDI version of the WICD work from CDR, therefore causing new items like XForms and SMIL Timing to fall to a new profile. Conformant WICD Full 2.0 by Inclusion user agents must support XForms 1.1 [XFORMS11] specification as a child language. Conformant WICD Full 2.0 by Inclusion user agents must support SMIL Timing Module [SMILTIME] specification as a child language. What the profile identifier is and how it should be used. Define how SVGDocument and HTMLDocument are minimally needed and if there are any conflicts to resolve (like title.